Wool roving, hand embellished with couched yarns and fleece. Embroidered with cotton and rayon floss with glass beads. approx. 10"x14". Made in 2008. Cotton fabric, cheesecloth, netting, yarn, wool roving, embroidery floss, a net bag from onions, felt, and beads combined in a 3 dimensional quilt. Mounted on Peltex for stability. 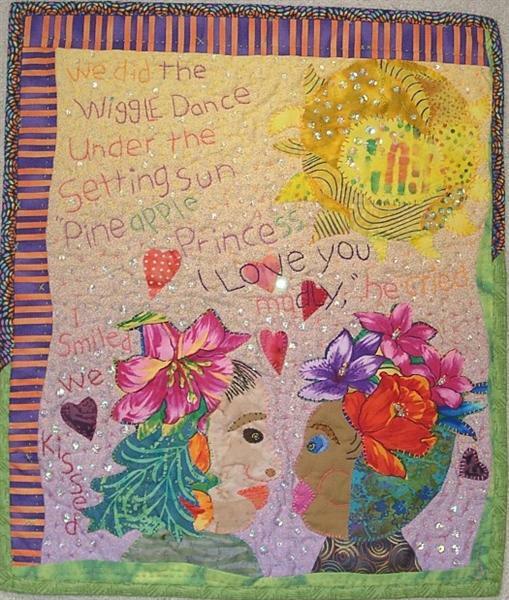 10" by 12"
Made for Karen, my daughter, the original Pineapple Princess. Size 19"x23". Made in 2005. Roving and Yarns, trapped under nylon netting, machine and hand stitched, with glass beads. Cotton Lame. Size 10"x12". Made in 2008. 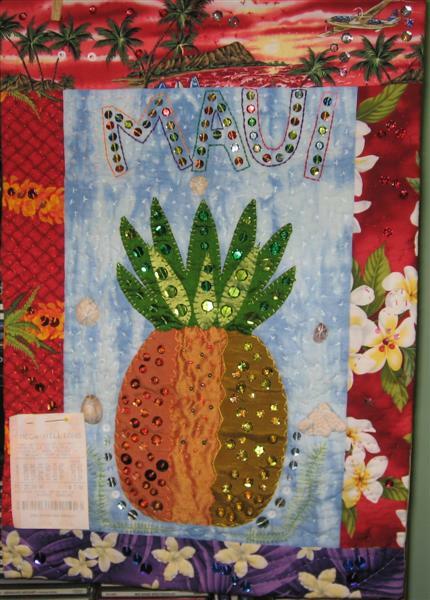 The border fabrics were purchased when we visited Maui. We pin our lottery tickets to it in hopes of winning, as this will be the only way we can move to Maui. Made in 2006. Batik fabrics, appliqued flower, and hand stitched. Approx. 7"x9". made in 2008. Recurring dream from childhood. 21"x26". Made in 2005. Batik fabrics, appliqued and machine stitched. 10" by 12", made in 2008. Layered fabric, including tulle, lame, and cotton batiks. Hand stitched, couched roving and yarn. approx. 16"x20"". Made in 2008. 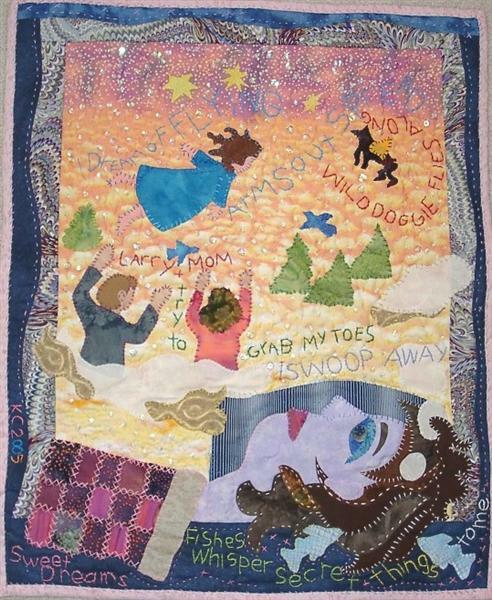 Many layers of roving, yarn, and fabric, machine stitched, quilted, hand embroidered. Approx. 16" by 16", made in 2008. Cotton fabric, wool roving and yarns. Machined stitched, and hand embellished with floss and glass beads. 10"x12". Made in 2008. With gold rickrack and hand stitching,glass bead fringe and sequins. 10" by 12", made in 2008. Silk dupioni, with printed photo, hand embroidered. 10"x12". Made in 2008. Silk dupioni and batik cotton fabrics, hand stitched, with brass charms. 10" by 12", made in 2008. With cotton fabric, yarn, ribbon and measuring tape, glass bead fringe and sequins. 10"x12". Made in 2008. 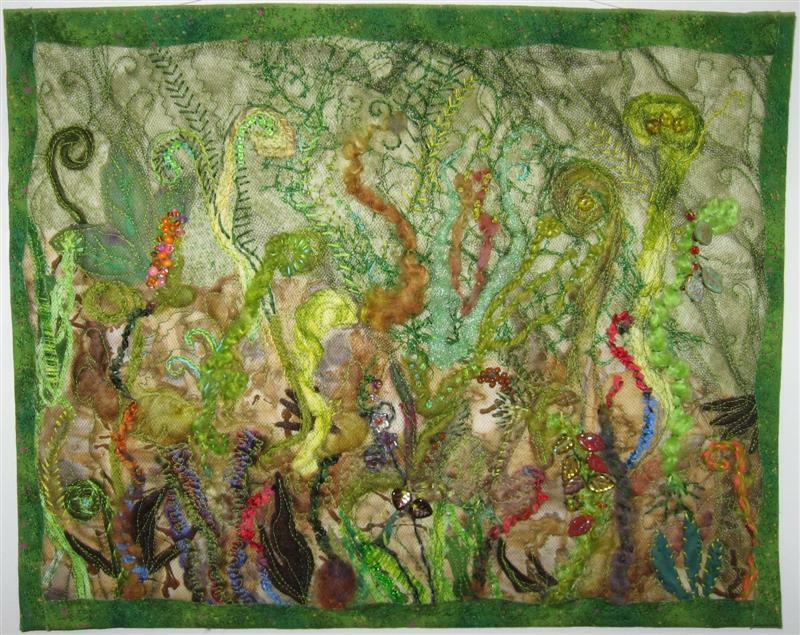 With embroidered vines, cotton fabric, glass bead fringe and sequins. 10"x12", made in 2008. With stars, cotton fabric, glass beads and sequins. 10"x12", made in 2008. With red sequins, cotton fabrics, hand stitched and glass beads. 10"x15", made in 2008. On pink with roses, cotton fabric border, hand stitched sequins and glass beads. 10"x12", made in 2008. With green ruffle, sequins, hand stitched, glass beads. 10"x12", made in 2008. With purple stars, hand stitched, sequins and glass beads. 10"x12", made in 2008. Drawn by Mary Riss, hand stitched on aida cloth, cotton border. 10"x12", made in 2008. Drawn by Madeline Nowicki, hand stitched on aida cloth, cotton border. 10"x12", made in 2008. Wool roving, yarn, cotton and nylon fabrics, machine stitched. 12"x12", made in 2008. Silk, polyester and cotton fabrics, hand stitched and appliqued" 10"x12", made in 2008. Dupioni silk fabric, hand felted wool, cotton and rayon thread, hand stitched. 10"x12", made in 2008. Wool and acrylic felt, cotton fabric, hand stitched. 10"x12", made in 2008. Cotton fabric, plastic net, yarn, sequins, hand stitched. 10"x12", made in 2008. Felted wool roving, machine stitched. 10"x12", made in 2008. Wool and acrylic yarn, sequins, cotton and rayon thread, hand stitched. 10"x12", made in 2008. Wool and acrylic yarn, nylon net, hand stitched and sequins. 10"x12", made in 2008. Cotton Fabric, charms, glass and plastic beads, hand stitched. 6"x8", made in 2008. Cotton fabric, glass and plastic beads, hand stitched.